Summary: Which child would you save? A decision no parent can even fathom. Do you ever just look at a book and know that you have to read it? 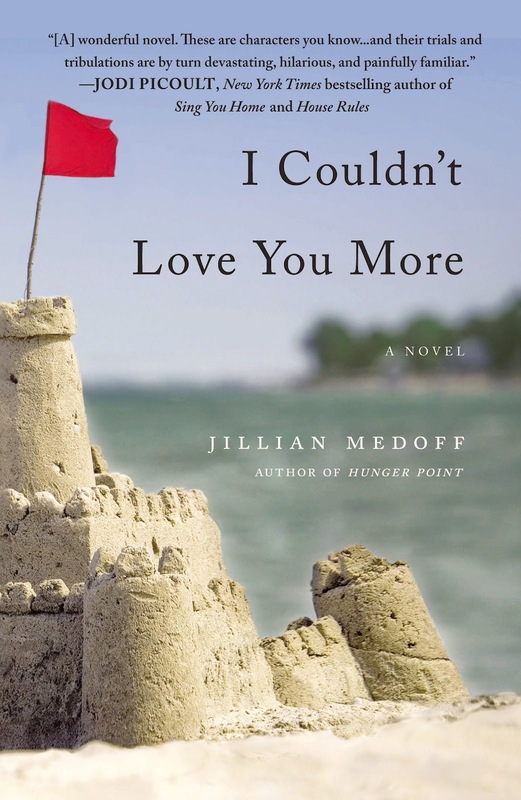 Well, that was certainly the case with I COULDN'T LOVE YOU MORE by Jillian Medoff. While I admit that the cover initially drew me in, it was the summary on the back that really sealed the deal. I COULDN'T LOVE YOU MORE sounded like a book with wonderful characters and an emotional story, and I was sincerely hoping that it would tug on my heartstrings. After reading the book in less than a day, I can tell you that's exactly what my reaction was to this novel. I COULDN'T LOVE YOU MORE tells the story of Eliot, a mother to three girls -- two stepdaughters and one of her own. Eliot seemingly has it all, a good job, a wonderful partner, three gorgeous girls, and a strong relationship with her sisters and mom; however, when she runs into her ex-boyfriend Finn -- her first love and the man she thought was her soul-mate, she suddenly begins to question her happiness and her priorities begin to change. Eliot begins putting the secret time she spends with Finn ahead of everything; and one day, an incredibly unfortunate accident occurs while Eliot isn't paying attention. Not only does this accident have horrendous repercussions for Eliot's stepdaughter, but it also threatens to break apart everything that Eliot values in her life. I thought I COULDN'T LOVE YOU MORE was an excellent example of everything I've come to know and love about women's fiction. I appreciated all of the characters (notice I didn't use the word loved) and I thought they were very realistic -- flaws and all. In addition, I was hooked to the story and desperate to see how things eventually worked out for both the children and the adults in the novel. And finally, I was touched by this story and loved how it made me reflect on my own life. While I'm tempted just to tell you that the characters and story were very good and just jump right into my thoughts and emotions about the story, I don't think that would do justice to the book. So I will begin by telling you that the character development was very well done. I thought almost all of the characters in the story were interesting, and I especially appreciated the dynamics between Eliot and her sisters and her mother; however, it was Eliot's character that gave me the most food-for-thought. I will be the first to admit that Eliot infuriated me and I thought she was extremely immature in her reaction to re-discovering her ex-boyfriend. That's not to say that I didn't like her at times because I did. I'm just saying that she was extremely flawed and I found myself being very judgmental about her actions. In many ways, I respected Eliot for how well she did as her role as a stepmother because I know I wouldn't be as capable; and who can blame her for sometimes putting her own child ahead of her stepchildren -- isn't that just basic human nature? Despite being furious with Eliot for a good portion of the novel, I do appreciate how Eliot resolved her issues, especially her guilt; and I think she matured a great deal by the end of the story. Another great thing about I COULDN'T LOVE YOU MORE was the story itself. I was drawn into Eliot's minor obsession with her ex-boyfriend and I did find it interesting how she reacted to him and her partner. I appreciated how the pace of the story picked up as Eliot became more and more caught up with Finn, and I definitely liked the direction the story went after the accident. There wasn't a dull moment for me in this story, and I found that the author did a wonderful job of balancing humor in the story with the tragedy. However, what I enjoyed most about I COULDN'T LOVE YOU MORE was how this book made me feel. I can't imagine the guilt that Eliot must have felt when the accident happened on her watch, and I was physically sick for her. And quite honestly, while I wouldn't be on the phone with an ex-boyfriend, I could totally imagine an accident happening while I was on the phone with someone or distracted for a minute or two. I think all moms will relate to just how quickly your life can turn upside-down when disaster strikes and feel some sort of affinity with Eliot. Because I was so affected by what happened to Eliot, I began really thinking (and questioning) some of my mothering skills (or lack thereof.) There is a lesson in the story that accidents do happen and we must learn to forgive ourselves; however, I can't even begin to imagine how difficult that would be. I also appreciated that the book demonstrated that there are consequences to our actions, sometimes painful ones; and it was almost heartwarming to see how the characters in this story handled some of their hardships. I truly can't stop thinking about this novel and that's surely a sign of a powerful book. There is no doubt that I COULDN'T LOVE YOU MORE would make a wonderful book club pick, especially for a group of moms. There is a reading guide available with twelve excellent questions. Some of the topics you might want to explore include sisterly relationships, mother/daughter relationships, parent/child relationships, guilt, forgiveness, grief, choices, consequences, personal privacy, blended families, and redemption. I adored I COULDN'T LOVE YOU MORE and I highly recommend it to fans of women's fiction. Thanks to KMSPR for providing a review copy of this novel. This book sounds fantastic! I prefer characters who are flawed because I can relate to them more. I can't wait to meet the author! wow this sounds like a great summer read! This sounds really good, although I hate character names that aren't clearly one gender or another - it gets confusing for me! This sounds like a great book. The cover definitely draws me in since my boys are very into sandcastles right now. it all sounds compelling, but you read this in a day? That almost is unheard of in my life, and probably yours too because I know you have the same kind of busy going on. Holy cow. That says something about the writing.